A stunning film on Pasolini, in particular dealing with his murder. I very much want to write more about this film, but it will have to wait until my next viewing… I have it here (a gift: thank you!). And you, Luciano, will remember our arrest, at which I was charged with being responsible for the propaganda — in reality it was Guido. From that point on we were constantly and more intensively kept under surveillance. We often went to Versuta to sleep; Guido had long since resolved to go to the mountains. At the end of May 1944 he headed off and there was no chance of persuading him to remain in Versuta, to hide there, as I finally did for a year. I helped him with his departure one morning, very early… he finally arrived in Pielungo where he joined Osoppo’s company. That was the beginning of his legendary undertakings about which I know so little. His letters were sparse and dark. At that time there were very few patriots in the Karner Mountains; Guido’s squad consisted of six or seven men who had to pretend to be an entire company… for some months there were increasing problems with a group of traitors who betrayed the liberation and sold themselves to Tito’s forces; the Osoppo followers in this area, led by Bolla and to which Guido also belonged, refused to capitulate to the Yugoslavian communists’ demands and join the ranks of our enemy, Tito. That was the situation in November 1944; and the situation became increasingly tense, until one day some members of Garibaldi’s brigades from Bolla showed up and requested to join Osoppo’s followers after having allegedly escaped a raid. Then, suddenly, they dropped their disguises and shot Bolla, gauging out his eyes, and then massacring Enea; all the others: the poor young men, 16 or 17 of them, they captured them and shot them, one after the other, all of them. That all happened on the Almen near Musi. On that day my brother was with Roberto and some others in Musi, they wanted to go to Bolla to give him some letters; there they heard the shots, saw someone who was trying to flee who called to them that they should also flee, turn around and leave, that there was nothing more they could do now. The others were persuaded to leave — with the exception of my brother and Roberto; they wanted to see what they could do, whether they could somehow help the poor young men. But they were powerless against the hundred or more traitors. After a few days they were all brutally murdered. The funeral for their exhumed bodies took place some months later, after the Liberation, with a great ceremony, in Udine. Today Guido lies in the cemetery in Casarsa. The truth is not in the one dream, but in all the dreams together. The effect of this film on me was like waking up from turbulent dreams with childhood feelings in my gut, crotch and spine, feelings of confusing lusts, desires and yearnings. Pasolini died on November 2, 1975 at the beach of Ostia, near Rome, in a location typical of his novels. He was murdered brutally by being run over several times with his own car. Pino Pelosi, a hustler, was arrested and confessed to murdering Pasolini. On May 7th, 2005, he retracted his confession, claiming that unidentified men had killed Pasolini. He gave threats of violence against his family as the reason for his erstwhile confession. The investigation into Pasolini’s death has been re-opened following Pelosi’s recantation. His murder is still not completely explained: some contradictions in the declarations of Pelosi, a strange intervention by Italian secret services during the investigations and some lack of coherence of related documents during the different parts of the judicial procedures brought some of Pasolini’s friends (actress Laura Betti, a close friend, particularly) to suspect that his murder had been commissioned. It is true, indeed, that Pasolini, in the months just before his death, had seen many politicians, telling them that he was aware of certain crucial secrets. Following Pelosi’s statement of May 2005, the Rome police has reopened the murder case; judges, however, considered the new elements insufficient to continue. Pasolini was buried in Casarsa, in his beloved Friuli. In the grave he wears the jersey of the Italian Showmen National Team, a benefaction soccer team founded by Pasolini among the others. New evidence this year (2005) points to Pasolini being murdered by an extortionist. The 17 year old that was found guilty of killing him, Pino Pelosi, revealed this year that three men with a southern Italian accent killed him. 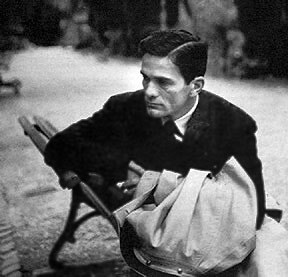 Testimony by Pasolini’s friend Sergio Citti indicates that some of the film rolls from Salò were stolen and Pasolini was going to meet with the thieves after a visit to Stockholm, November 2, 1975. He told others that he knew he would be murdered by the Mafia. Shortly after he was found dead in Ostia outside Rome. The wisdom of an heep of learned men? "Here bygynneth the Book of the tales of Caunterbury"